For the past 4 years, Aveda Institute Portland has raised money during Earth Month for Hopkins Demonstration Forest, a 140-acre protected forest open to the students and the community as a classroom, outdoor laboratory, and scenic space to spend the day exploring. Last year, in 2018, we raised $30,764 for Hopkins and this year we are raising the bar a little bit higher: for 2019, our goal is to raise $31,000! 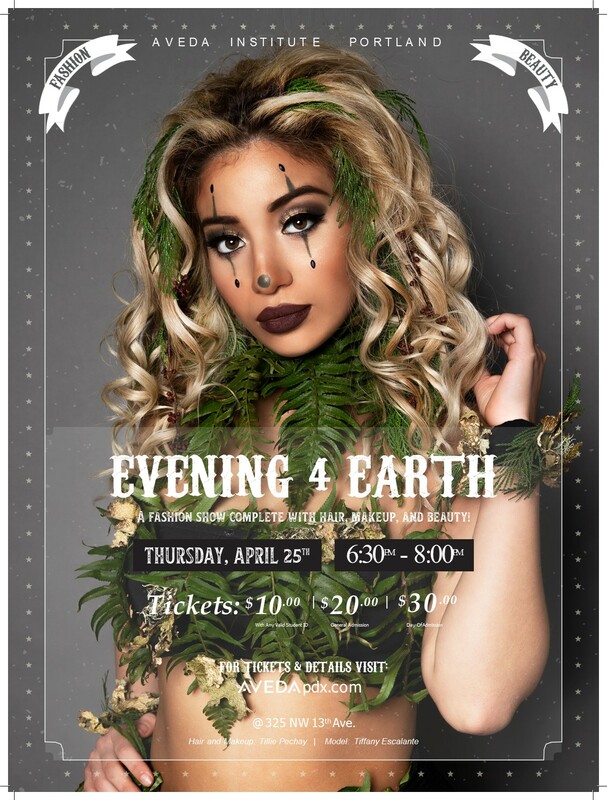 To combine fashion and fundraising, the grand finale of Earth Month is Evening 4 Earth, a hair and makeup show where students get to see their ideas come to life and walk the runway in front of friends and family. This event is the driving force behind the marketing for the entire month of April from posters, tickets, invitations, and social media. Each year in order to determine this special image, which is the face of Earth Month, students get creative and come up with their own visions of the year’s theme. This year at Evening 4 Earth we are putting on even more of a production. Grab your baton and top hat because we are heading to the CIRCUS! With this whimsical theme in mind, students got to work putting together hair and makeup looks to enter. The submissions came flowing in right up until the deadline, then they were posted to Facebook for the voting to begin. The 5 images with the most “likes” moved on to the final round to be voted on by a panel of judges made up of faculty and instructors. 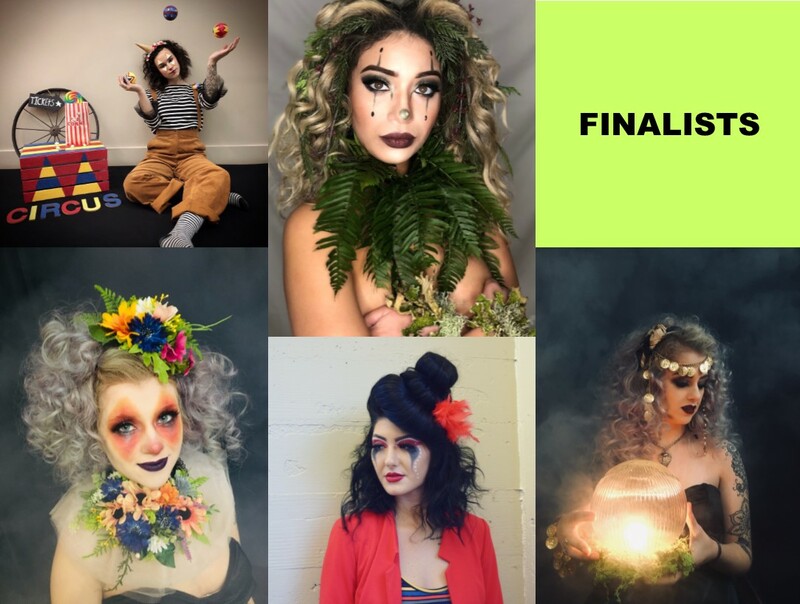 Image: Contest Finalists, clockwise from top left: Hailey G & Tatiana V, Tillie P, Megan C & Janelle L, Robyn T, Megan C & Janelle L.
Through a close vote, the final entry was chosen to go on to be captured by professional photographer, Kendra Barber, in the studio. The winner, Tillie Pechay, an Esthiology student with a background in makeup along with her model, fellow Esthiology student Tiffany Escalante, were selected by the panel of judges to bring their look to life again as the face of Evening 4 Earth. While creating the look, I got the scoop behind Tillie’s inspiration as well as why she chose the beauty industry in the first place. Before coming to school at Aveda Institute Portland, Tillie had been working in the beauty industry for several years. She first started out working at a makeup counter because of her love of makeup, sales and helping other women with tips and skills to bring their own look to the next level. From there, Tillie began working at Revive Medical Aesthetics. There she realized that her passion went even further than makeup and product expertise, and she wanted to peruse Advanced Esthetics. After she graduates, Tillie plans to train in Lash Extensions and offer that service at Revive. As soon as the Evening 4 Earth Marketing competition was announced, Tillie knew she wanted to enter. She was inspired right off the bat by our mission of environmental stewardship and started to gather inspiration. Then once the Circus theme was introduced, she had to change her focus. “I had an idea in mind, but once the circus theme was thrown in, I had to change it up.” Tillie found some clown makeup images that she liked and softened them up to look more fashion-forward. Then for wardrobe, she found ferns, branches, and plants from her backyard to incorporate into the look to bring back in the original earthy concept. Tiffany also had a love for makeup before coming to Aveda Institute Portland. She has always been conscious of skincare and loved trying different beauty treatments and services. When she first heard about the Earth Month Marketing competition, she felt a little out of her element. She wasn’t sure if she was ready to take the leap but was still intrigued about Earth Month as a whole. She was nervous when Tillie asked her to be her model, but ready for the challenge. Since winning the competition, she is so excited to be the face of Earth Month 2019 and is so glad that she took the chance of doing something that made her step out of her comfort zone. Throughout April, you will see Tillie’s work on the Earth Month posters, Evening 4 Earth tickets and all over our social media and flyers. To watch the look come to life and hear her beauty tips and techniques that went into the final look, stay tuned for part-2 to see a behind the scenes video.